Insane power, but so much fun! If space had permitted, a more appropriate title for this article would have been something like: “Please consume in moderation, even if the car doesn’t”. 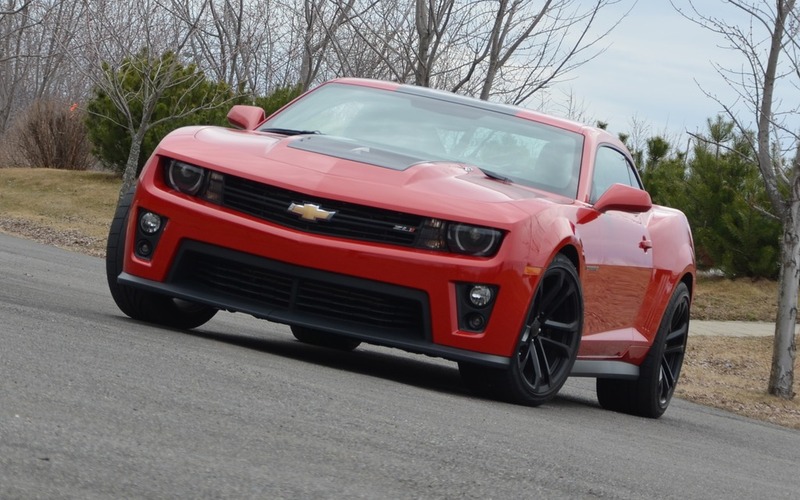 The reason for the ZL1’s unquenchable thirst is that it is powered by a supercharged 6.2-litre V8. Yes, the very same V8 that powers the Corvette ZR1, but it’s a little less powerful in the Camaro for the sake of respecting the hierarchy at GM. Here, it features a “mere” 580 horsepower and 556 lbs-ft of torque, which is still more than enough to consume 16 litres/100 km in regular driving conditions. When you’re driving with a little more gusto, putting the pedal to the metal several times in a row for the sheer pleasure of hearing the engine and feeling pinned to your seat, fuel consumption is more like 21 or 22 litres/100 km. On a race track, where you’re always in high gear, expect an average of 26 or 27. And it takes super, of course. Sure, the fuel consumption is scandalous, but it is infinitely less than what we saw from the less powerful muscles cars of the 1960s and 70s. The Tremec six-speed manual transmission is also guilty of contributing to the ZL1’s barely acceptable fuel consumption rate. In sixth gear, at 100 km/h, the engine revs at just 1,750 rpm. At 120, it revs at 2,100. As the torque is more generous and available over a very wide range, it’s possible to pass anyone who might be in your way without even having to downshift. The stick and clutch offer some resistance but without being restrictive – quite the contrary, in fact. I can’t imagine the Toyota Yaris’ clutch in such an athletic car! Last year, I attended the launch of this impressive vehicle (the ZL1, not the Yaris) at the Virginia International Raceway. I really like the pedal layout as it helped facilitate heel-toe technique. Strangely, I’ve had a harder time using this technique in Quebec. Have the pedals been modified? Did I use different shoes? (Definitely). Did my foot shrink? (I’m 51 years old, but you never know...). The ZL1 can also come with an automatic gearbox. At the launch, this six-speed transmission truly impressed me and resulted in the fastest laps on the track. That said, as fantastic as the automatic’s performance is, I prefer shifting the gears myself – especially in such a monument to virility – at the risk of getting cramps in my left calf in heavy traffic. The ZL1 also comes as a convertible, for an extra $5,750 ($64,250 versus $58,500). If you want my opinion (and even if you don’t) a car this powerful and this brimming with testosterone should only be offered as a coupe. After all, you don’t buy a ZL1 to show it off on The Main! The fun part of the ZL1 lies in the three buttons on the console. They allow you to play with the various settings of the magnetic suspension, power steering and most importantly, traction and lateral stability controls. They also help access the PTM (Performance Traction Management) that features five settings. At Level 1, all of the electronic systems are activated to give you a racetrack-style ride, even in the rain. At the other end of the spectrum, Level 5 is reserved for experienced drivers. 580 horsepower is nothing to sneeze at! Even without using the PTM, with every last one of the systems active, it’s very easy to fishtail. The lateral stability control quickly takes over and prevents inexperienced drivers from putting the ZL1 in the ditch. Using this car without the aides and without the necessary knowledge will have disastrous results. Unexpectedly, the ZL1 is quite comfortable – even on our uneven roads – thanks to the magnetic suspension. In Sport mode, you’ll feel the ups and downs of the roadways a little more, but you won’t leave the car with impression that you spent the day in a paint shaker. Test driving a car in the secure environment of a race track and on perfectly manicured public thoroughfares is one thing; test driving the very same car on Quebec roads is something else entirely. I’ve been disappointed more than once – but not this time! Despite the obscene fuel consumption, atrocious visibility, almost non-existent interior space, and considering that driving in the rain is challenging even when all the safety systems are active, you’ll fall in love with the ZL1! If for no other reason than the absolutely exquisite sound of its big dual exhaust. And the ride did not disappoint. It’s quite an experience, leaving you feeling invincible on the road. The return to reality, in my Yaris, quickly brought us back down to Earth. 1/10	Greenpeace, what are you doing about this? 9/10	We forgive this car all its faults!